So I realized that last week that I was running out of flags to talk about and thus realized that I was going to have to get creative to get this train rolling and happily, the Missus and her interior design skills provided me with an answer. 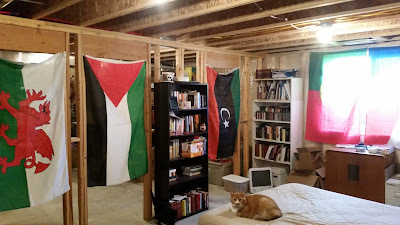 You see, we had company come up last weekend for Little Dude's Birthday, so that meant we needed to get our spare bed from the Parentals House to set it all up in the basement. Which was easy enough, but it still looked a little sparse and well, open- like an unfinished basement. Obviously, the first thing I thought about was flags. I have a tote full of the things and while it wasn't a perfect solution, it'd work for a weekend. I asked the Missus what color scheme was she envisioning, she replied red, green and brown. (You can sort of see where they got the basic idea from, right?) 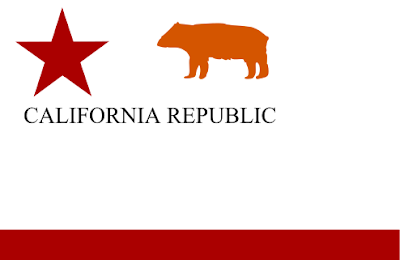 Anyway, for obvious reason, this came to be called the Bear Flag and the revolt, short as it was, became known as the Bear Flag Revolt and we'll never really know what might have happened to the California Republic, because the Mexican-American War sort of took over events pretty fast and the Republic's Military was subsumed into the California Battalion commanded by Captain John C. Fremont (who is actually a really interesting guy. I read this book about him- which I think I still have somewhere. Maybe. It was really good and you should read it though) and by July 9th it was all over and California became part of the Untied States. Here's the crazy thing though. California became a state in 1850 and the current, official version of the Bear Flag was first adopted in 1911. I did some digging on the interwebs, because Wikipedia didn't have the answer and you know what? 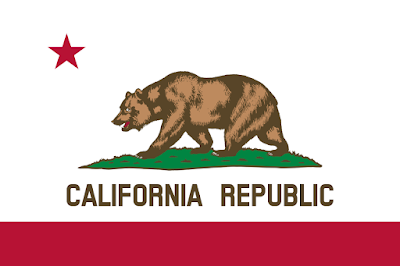 I'm not sure that California had an official state flag between 1850 and 1911. There was a little bit of a brouhaha during the course of the Civil War where pro-secessionist people down south flew the Bear Flag instead of the Stars and Stripes and it's all... a bit mysterious.